Radio 5 Live has really woken up to racing. Following last week’s profile of Tony McCoy the station is to broadcast a feature about Frankel and Sir Henry Cecil this evening. The programme, called “Frankel - Starstudded”, goes out at 7.30pm, looks at the science and strategy of breeding, taking the preparation of Frankel for his stud career by way of illustration. 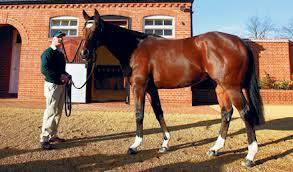 Frankel has now moved to Banstead Manor Stud, near Newmarket. At £125,000 a time his stud earnings this season will far outweigh those of his racing career, in which he won all 14 of his races. The programme includes a candid interview with Sir Henry Cecil, in which the trainer talks about how difficult he found it to keep going last summer as he managed Frankel’s career at the same time as he was fighting against cancer. Cecil says he’s now “raring to go” as his health has steadily improved over the last few months. He’s also confident that Frankel will prove a huge success at stud. "The pressure's off me now," said Cecil. “Frankel has a new career starting and it's very exciting. As he's so close it means I can go and see him. You never know (when horses go to stud) but he was such a terrific racehorse with so much ability you feel he'll pass it to his offspring. It was a difficult year because I wasn't well; I had a lot of treatment and everything. When you're trying to work and you've got a horse of that calibre there's a certain amount of pressure at being able to do it properly. I found it more pressure trying to be there for him when I wasn't feeling very well. I'm picking up the whole time now, I had three and a half weeks doing nothing in Dubai, it was a lovely holiday, I'm getting my energy back, putting on weight and raring to go."